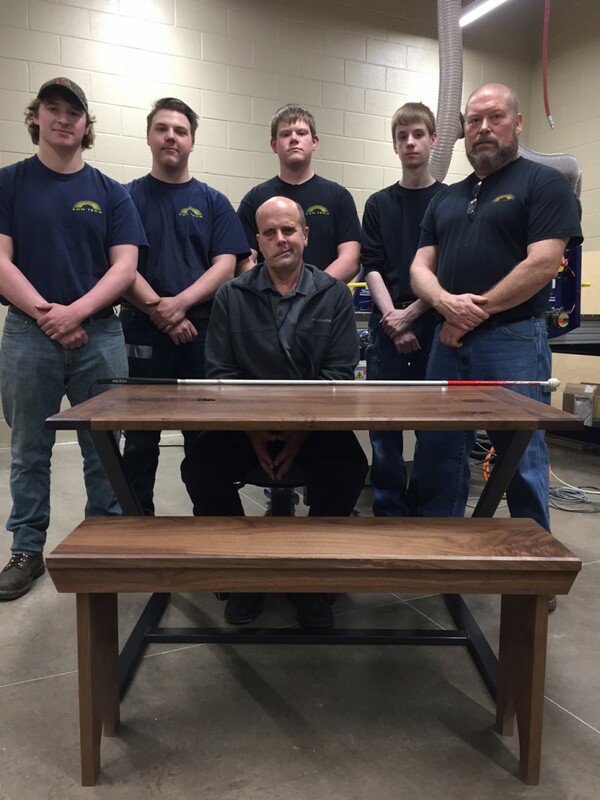 KWPA member SUN Area Technical Institute will never cease to impress you with the stories of hard work, dedication and craftsmanship that comes out of the Advance Wood & Welding program. However, there are some stories - like this one - that will just surprise you. The following is a story that combines community service, skill and compassion. We thank Mr. James Romig, the Advance Wood Instructor for the program, for sharing this with us! "Mike Hobbins has been a Susquehanna Valley resident for many years. Community members have enjoyed his positive demeanor and relentless will to help others, young and old! About 4 years ago, Mike was unfortunately shot in a hunting accident that left him permanently blind. Life as he knew it, instantly changed forever. A career as a highly skilled precision machinist was over. A love for maintaining his New Berlin real estate property with a pool, ceased. He and his wife had to adjust to this abrupt transition of being unemployed and life style change of helping others. Mike was in a very unfamiliar territory of not being able to assist others, let alone trying to educate himself to this new life of darkness. Through this tragedy, former Mifflinburg HS Football Coach Hobbins was introduced to Mr. Joseph Weisser by his vocational rehabilitation counselor. Instantly, a brotherly friendship was created. Mike started volunteering at SUN Area Technical Institute to assist Mr. Weisser in doing job interviews for all the students. Over the past 3 years, Mike has grown to learn many of the students and has volunteered 40-50 days a school year. He has not missed a Graduation Program of "Hearing" these students walk across the stage to receive their Program Certificates. Mr. Hobbins has learned many "new ways" of living and learning, again. As Joe Weisser states, "He pushes me to think outside the box... He challenges me to go faster and further on our tandem bike... To run in local road races together... We have become a fixture on the rails to trails and Rt 45... People encourage us to work together... In return, I challenged him to come up with a business plan that we could both implement". So, after a few months of thinking! Mr. Hobbins came up with Blindi.... This stands for blind intelligence. Their Administrative Assistant, Shayna Baker (a former optical specialist) added 2020, as in perfect vision. Thus the creation of Blindi 2020. This LLC will try to provide services to others with disabilities, meet Mikes passion of investing like the tv show of "Cramer", and possibly other "Sweet" morsels of interest. SUN Area Technical Institute is always up for the challenge of helping Mike in any capacity. The Ad Art Program designed the Blindi 2020 logo. Advance Wood & Welding created a table and bench for Mike to get his investment strategies started. Mr. James Romig, Advance Wood Instructor designed this very unique walnut and metal table. The HOPE is that this table is the platform for Mike Hobbins to regain his independence and to assist The Susquehanna Valleys most prized commodity: IT's PEOPLE. Mr. Hobbins will MAKE IT HAPPEN and he will once again be assisting all that are in need." 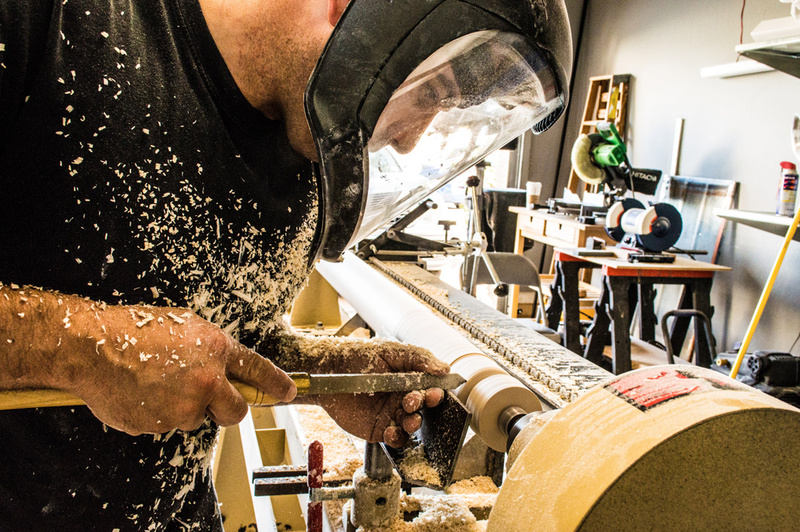 We are delighted to see students in the woodworking industry using their skills to give back to the community. We wish Mr. Hobbins a successful venture and look forward to sharing more stories of success that started around this table.